In a bout between two board architectures, compatibility and flexibility give PC/104 the upper hand. The stack that is so much more than a rugged PC. PCIe/104 Type 2 continues the PCIe/104 legacy of two high-speed surface mount connectors, but Type 2's mechanical design is built to ensure that conflicts with existing PCI Express x1 or USB peripheral cards are a thing of the past. The PC/104 Embedded Consortium is concentrating on advancing our specifications and reviewing technical proposals for our specifications. 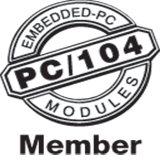 Revisions to the PCI/104-Express and PCIe/104 specification will open new prospects for Consortium members. Discover the details about card stacking, timing specs, system power supply, and other PC/104-related topics. ESC Silicon Valley kicked off a new year of activities for the PC/104 Embedded Consortium. PCI/104-Express meets the PC/104 Consortium's goals of simplifying implementation for peripheral board manufacturers and users. The products section of www.pc104.org gives members a place to showcase their PC/104 products and gives OEMs and end users a place to find these products. The PC/104 architecture addresses the whole spectrum of power requirements.